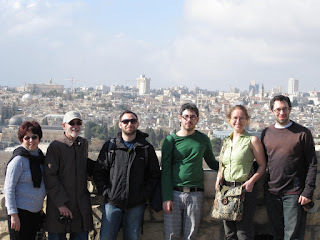 After our fourth abundant Israeli breakfast and what is now being referred to as "blogstorm", most of our group decided to visit the Mountain of Olives in East Jerusalem. Although we were in a hurry to avoid the coming rainstorm, we decided it was worth the time to try figuring out the Arab bus system on the east side. After some communication attempts and travel intuiting, we located the closest Arab bus station and were seated for our ride up the mountain. At the top, we found good-natured shopowners (Mike was teasing that I speak convoluted English with an accent when I'm traveling "This chocolate is good? What is price?" and the shopowner returned his jabs with a poignant blank stare) -- and fun friendly "souvenir" salesmen (when offering members of our group ancient coins, we offered to trade them 1:1 for modern American coins, out of which they seemed to get a good chuckle. Another time my mom replied to a roaming entrepreneur that she was waiting for my dad, but accidentally said she is waiting for her dad. The guy didn't let her hear that end of it, he was sure to tell my dad about the slip when he arrived. 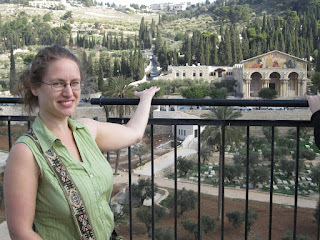 In addition to its friendly salespeople, and being the most holy site for burial - this is the first place God is supposed to look for souls to save when the Messiah comes [again] - the views of Jerusalem are spectacular (see photo). We hiked down, through the area of the Garden of Gethsemane (where Jesus had his last supper), and on to the Wailing Wall for a second time so I could deposit Bubby's message. This time, the wall was not crowded at all; the traffic was so light that I was stopped by a kiosk of Chabad Rabbis coercing people into wearing Tefillin and saying a few prayers. It was an interesting experience, I definitely appreciated more my second visit to the wall this week. Not knowing I had been there earlier this week, the Chabad Rabbis welcomed me back to the wall, a nice gesture. We headed on to the Church of the Holy Sepulchre where the items of Jesus' crucifixton were gathered during the Crusades 500 years ago. Not to oversimplify things, but for non Christians I will say that they have many treasures including Jesus' burial tomb, a chunk of cracked rock where Adam's skull was buried, and a basement quarry from the time of Emperor Constantin. After some mild debate from hunger, we had lunch at a restaurant in the Christian quarter. We tried Israeli (Maccabee) and Palestinian (Taybeh) beer, and to paraphrase my brother Mike, we negotiated a peace process in our stomachs. The Palestinian beer beat the Maccabee beer hands down in aroma, taste, texture, and every other sense. 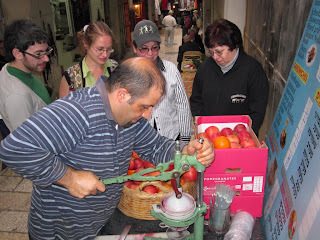 Although we wanted to visit numerous sites on our final night in Jerusalem, the lack of time and lack of consensus meant we'd be trinket shopping in the bazaars of Old Jerusalem. Noteworthy was the Dead Sea Mud Soap (oxymoron). If you don't have time to haggle, don't bother coming. But if you're not willing to accept their offer, don't start bargaining with them. Mike made some enemies and was even cursed by a Bedouin. Back at the hotel, Mike checked his bank records to discover that he had accidentally bought 30 Peacoats from Macys.com earlier in the day (the order process kept failing so he kept trying different combinations of his address, credit card number, different computers, internet connections/VPN, etc). I wonder what he'll do with an army of coats! 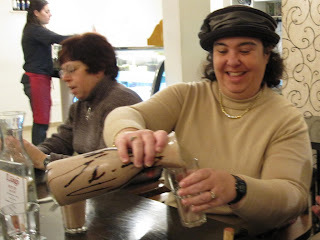 Tel Aviv 12/26/2009: in search of hummus!